Is it possible that your web host location could be affecting your SEO efforts? Does web server location even matter? Read more to find out. Your website needs to be fast. Google takes website load speeds into account in search results. The easiest way to get the most speed is by hosting your website as close to your user’s location as possible. You can achieve this by hosting your website in the same country as your visitors. Page load time is one reason users abandon a website, as the average user is not patient enough to wait for a slow loading website. A recent research confirms that websites that load slowly are not good for businesses. 53% of mobile users will abandon a website if it takes more than three seconds to completely render. Google also considers page loading speed when ranking pages. If your website page takes more than a few seconds to load, Google will simply drop your rankings. Apart from other server-related issues, hosting far from your target users will make your web-page load time high. For websites targeting users from only one country, it is a good idea to locate the server in that particular country. However, it is a different story for websites targeting visitors from numerous locations or from all over the world. Websites like these need to use Content Delivery Network (CDN) to help spread their content. How Search Engines See Server Location? I must point out that this response was made sometime in 2011. This means that while you should choose a hosting server location in the country of your target audience, it is not as important as it used to be. Google is making constant changes to allow for a more global setting. This Google article on global targeting will provide more insight. Search engines like Google, Bing or Yandex allow website owners to set a country target in their webmaster tools. If your website uses a country TLD (.uk for example), then you will be unable to choose a target country. This is because Google associates TLDs such as these with a country location (.uk for the United Kingdom). However, if your website uses a TLD such as .com or .org, then you need to enter a country target in your webmaster tools. If you don’t do this, then Google or other search engines will carry out selections based on other criteria. Any or all information about location available in the website content, such as contact information, structured data or content snippets etc. Therefore, if your website is hosted on a server located in the United Kingdom and your website content is meant for users in Spain, it is very important to set ‘Spain’ in Google webmaster tools or other search engine webmaster tools. In a nutshell, it is not required to host your website on a server located in Spain. Setting international targeting in the webmaster’s tools will work just fine, but if you are using a .es domain, this won’t be required. If your website targets users from all over the world, it doesn’t matter where it is hosted. You only have to make sure your web host provides some form of CDN. A Content Delivery Network Service works by providing substitute server points for your visitors to get access to resources from your website. These CDN points are normally spread throughout the world. They help to bring access closer to your website visitors. A CDN service will ensure a faster response and download time for your web content. There are many CDN services available on the internet – some of which offer free services, while others offer paid services. Regardless of the type of website builder you have used in the site development, your site can get better through using a CDN. If your website’s users are from around the world, your page ranking will not be affected by where your server is located. It is more important that you make use of a quality web hosting server and a good CDN service. This will make your website load quickly, no matter where your visitors are located. If you have plans to pick a new web host or to change from your existing host, it is of some value to consider the location of the servers. If your website is targeted for a certain country or location, such as the United Kingdom, then your web host, its servers, and equipment should be located there. If not, your SEO success could be affected up to a point. If you’re moving over to a new host that is in the same geolocation, then this shouldn’t affect your site, but you’ll also need to consider other factors as well. To ensure that your website delivers speedy results for visitors, the key is to find a web host that does not overload their servers. More websites on a server mean more resources used. This can result in a slower page load for your website. It is also important to make sure that you are reducing page load time at your own end. This includes reducing HTTP requests, reducing image size and removing useless plugins. 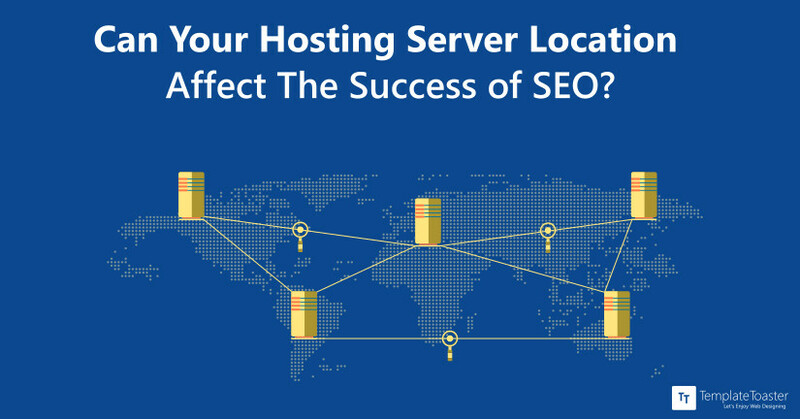 A hosting server location can have a major effect on your SEO and page ranking. That is if it affects your website page load speed. However, if you can use some other means – such as webmaster tools to set your geo-targeting, then you don’t need to worry about the location of your hosting server. It is wise though to host your website in a manner that gives your visitors ease of use. It’s notable to mention here that an appealing web design compliments the success of your website SEO so you better choose a tool like TemplateToaster, a web design software responsible to produce attractive SEO friendly themes compatible with all major CMSs giving you the picture-perfect result. James Cummings is CEO of Daily Posts and works with big brands like Domains4Less in the tech industry to deliver content and marketing campaigns. He has over a decade of project management experience on large scale IT and development projects, including working on over 250 WordPress websites.